Today we have so many superhero and comic book based movies that are released every year that it's almost funny to think that these sorts of films used to be considered too childish for movie studios. Sure there was the successful “Superman: The Movie,” but that movie was neither deep nor intimidating. When you also consider most superhero comic books were geared for very young kids and were very silly at heart, it's no wonder there weren't any studios that wanted to take a chance on adapting any of them to the screen. Batman was actually hurt the worst out of all the superheroes. Ever since he was adapted into the 1966 TV series starring Adam West he was seen as a campy character and was stripped of many of the dark undertones that made him such a compelling creation all those years ago. When Warner Bros. decided to put “Batman” into production they made a wise move in hiring a young Tim Burton direct the project. Though we can look back and see how perfect this was in the first place, you have to remember that the first film Burton made for Warner Bros. was “Pee Wee's Big Adventure,” and while “Edward Scissorhands” has the Burton look it was ultimately a family fantasy with dark elements. 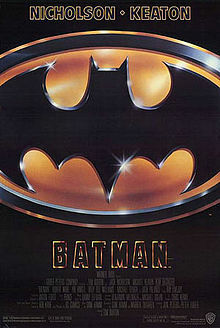 Burton was not a comic book reader but he had read some of the darker Batman comics, which made him interested in directing the film and bringing the character back to his roots. When the film was released it became a worldwide phenomenon and paved the way for Marvel to eventually take over the cinemas over a decade later. In that sense, it is easy to look back at the film and view it more as a popular game changing product than a movie, but that would also be taking away from why the movie caught on in the first place. When the film opens movie goers are treated to a visual style known as “Dark Deco,” which gives the movie a distinct noir look. It somehow managed to look like a living comic book, where extravagant art fused seamlessly with living actors who looked much more realistic than the fantasy world of Gotham City. Even the politicians in this movie wear colorful costumes that make them look animated on the surface, yet somehow drab with the clever use of lightening. 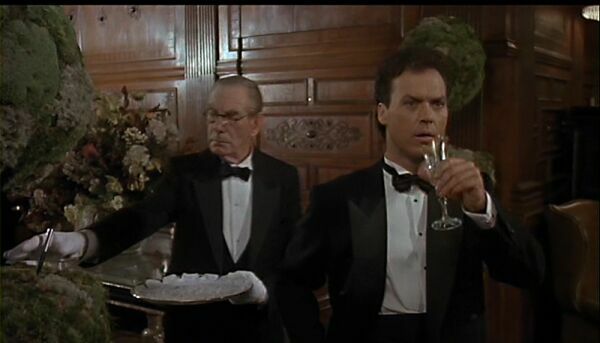 It's a great illusion that gives the eventual reveling of Batman (Michael Keaton) and Joker (Jack Nicholson) much more credible weight as visual characters. The story is also darker than anything people had been used to from the character in a long time. To illustrate the difference on the sixties TV series the Joker would want to steal a rare tuna fish to make the ultimate sandwich. Here his ultimate goal is to kill the people of Gotham. Why does he want to do this? Sadly, we don't really know. We witness the accident that causes Jack Napier to turn into the Joker that most likely soured his mood and twisted his mind, but we never really learn much about him as a character. The closest ideal scheme he wants from the world that we get is that he wants his face on the one dollar bill. Likewise while Bruce Wayne's origin story is delved into, he seems so detached by the world that it can be hard to relate to him sometimes. 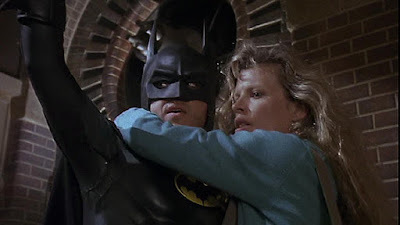 The movie does introduce Vikki Vale (Kim Basinger) as girl for Bruce to save and Joker to capture, but she almost seems like a means to an end rather than a true supporting character. Yet the fact that we are essentially watching two freaks battle with cool toys and stylish action scenes does provide enough interest so that the film is rarely boring. Later Batman films would be either much better than Burton's vision or much worse (depending on the director). What “Batman” itself brought to the table was it reinvented the whole concept of the summer blockbuster. It was the first film to make $100 million in the first weekend. It showed how important it could be to get a PG-13 rating. Burton got the clout to make many other movies (some of them classics now). 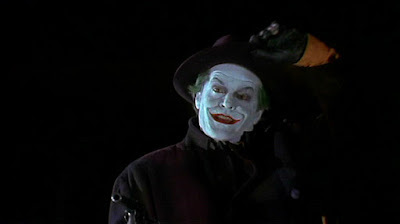 For comic book fans though the film was a gateway to the world to show that superheroes could be taken seriously. The story development and the characters in this particular movie don't seem very special these days, but I still admire the art style of the world and the direction that seems able to cover up the flaws to the point where you don't notice them while you're watching the film. I don't know what kind of recommendation that is, but like Batman himself it's an enigma worth taking a second look at. Parents, the violence is constant and very dark. Recommended for ages 14 and up.